A recent Florida church's burning of the Quran has created an "additional serious security challenge" in Afghanistan, warns Gen. David Petraeus, the top U.S. military commander in Afghanistan. Violence and rioting erupted in Afghanistan last weekend after word spread that Rev. Terry Jones, the leader of the World Dove Outreach Center in Gainesville, Fla., put the Islamic holy book "on trial" and burned it in a videotaped March 20 ceremony. At least 20 people were killed and many more injured as a handful of violent protests broke out in Afghanistan between Friday and Sunday, and angry crowds were heard changing "Death to Karzai" and "Death to America." Afghan president Hamid Karzai has called on Congress to condemn the burning. Petraeus, in a Sunday interview with the Wall Street Journal, warned that the threat posed to operations in Afghanistan by inciting anger among the masses was very real. "Every security force leader's worst nightmare is being confronted by essentially a mob, if you will, especially one that can be influenced by individuals that want to incite violence, who want to try to hijack passions, in this case, perhaps understandable passions," he told the Wall Street Journal. "Obviously it's an additional serious security challenge in a country that faces considerable security challenges." 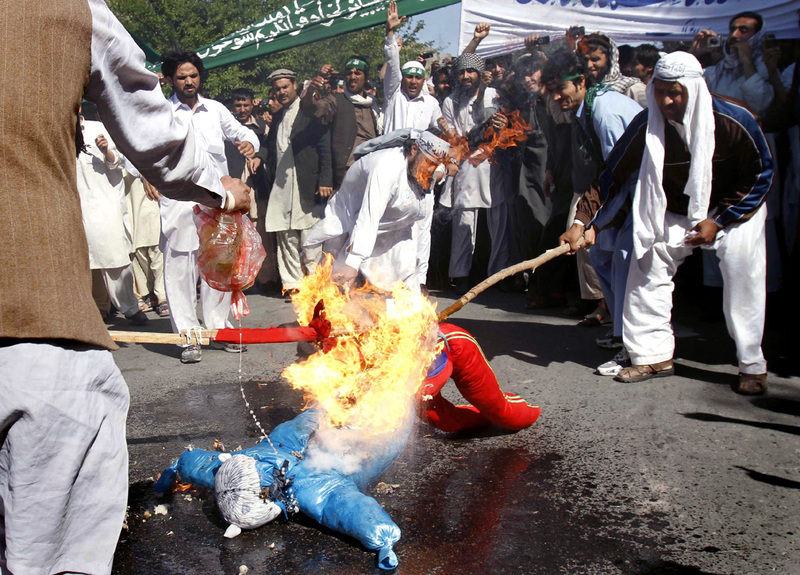 Petreaeus added that the burning of the Quran was "hateful, extremely disrespectful and enormously intolerant." Sen. Majority Leader Harry Reid on Sunday denounced Jones' "trial" - which he described as a "publicity stunt" - and said Congress would "take a look at" a possible condemnation of the act. "Religious extremism in any form is wrong," said Reid, in an appearance on CBS' "Face the Nation." "And certainly all these deaths is wrong." "Of course, this man in Florida who burnt the Koran, it's a publicity stunt," Reid continued. "He basically had nobody in his church anyway. And this was an effort to get some publicity for him. He got it. But in the process, ten -- 20 people have been killed." "We'll take a look at this, of course," he told CBS' Bob Schieffer, when asked about a possible congressional condemnation. "John Kerry, the chairman of the Foreign Relations Committee, has been on top of this. He's made many trips to Afghanistan. And I think we'll take a look at this. As to whether we need hearings or not, I don't know." Sen. Lindsay Graham, argued on Sunday that "we push back" against actions that put American troops at risk during wartime, and urged an official condemnation of the Quran burning. "I wish we could find some way to -- to hold people accountable," he said during a Sunday appearance on "Face the Nation." "Free speech is a great idea, but we're in a war. During World War II you had limits on what you could say if it would inspire the enemy. So burning a Quran is a terrible thing, but it doesn't justify killing someone. Burning a Bible would be a terrible thing, but it wouldn't justify murder." "Any time we can push back here in America against actions like this that put our troops at risk, we ought to do it," he added. "So I look forward to working with Senator Kerry and Reid and others to condemn this, condemn violence all over the world based in the name of religion." Jones first came into the public eye last September, when he threatened to hold a similar Quran burning event. But the conservative church leader was at the time deterred by a slew of national condemnations. Reid on Sunday voiced his suspicion that Jones followed through with his plan because publicity "had fallen down a little bit." "I guess the publicity had fallen down a little bit, so he decided to do this," Reid said. "It's really too bad. And I think people should understand the consequences of what they do under the guise of religion."